Dogs race for the finish line at the Can-Am Dog Sled Races in Fort Kent, Maine. Does your car’s engine have a cold wet nose? Or your tires, do they sport furry paws that dance in excitement when you come out in the morning? How often has your jalopy jumped up and landed a big sloppy kiss on your face? For most of us, our methods of transportation are cold hunks of steel and plastic that only come to life when we climb in and turn the key. Dog sledding is an enlightening experience. Come to Maine and discover how these warm-hearted creatures really love to take you on the ride of your life. Doggie kisses included. A group of archaeologists found evidence of dog sledding in the Arctic dating back almost 4,000 years. When visitors to the New World arrived, they adopted dog sledding as a means to hunt, explore, and for traveling in general. Soon people in snowy climes on both sides of the border found that having a sled and a team of willing dogs made life a whole lot easier. In Maine’s rugged interior, these animals proved invaluable to early settlers, and to this day provide transportation for those in remote areas. Sled dogs are bred for speed and endurance. 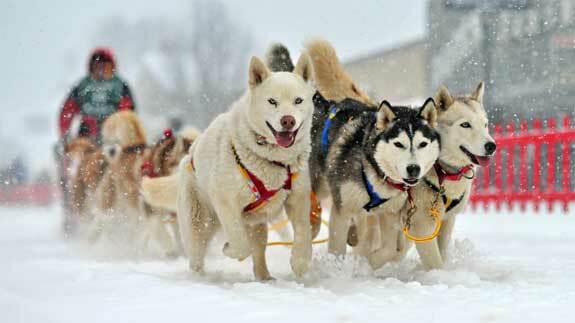 Racing sled dogs can pull at roughly 20 miles per hour and cover more than 25 miles in a stretch. In regular travel mode, dogs usually move at 10 to 14 miles per hour and can cover up to 80 miles at that pace. Some dogs, like the Siberian husky and the Canadian Eskimo Dogs are purebreds. Others, like the Northern Inuit, the product of blending German Shepherds, Siberian Huskies and the Alaskan Malamute, are mixed breeds. New England has the Chinook, a large, chunky dog of mixed breeds with a healthy dose of German Shepherd. Today dog sledding is a sport, as well as a way of life for many. An offshoot of dog sledding is dog skijoring. Instead of pulling a sled, up to three dogs are used to pull a cross-country skier. The extra “dog power” means that skier can cover more ground at a faster pace and with less effort. Dog sledding adventures are led by Registered Maine Guides and/or mushers. The guides are professionals that have undergone a number of tests to become registered with the state. A musher is the person who controls the dogs and drives the sled. Qualified outfitters, guides and mushers are found throughout the state. One example is Mahoosuc Guide Service (mahoosuc.com), located in Grafton Notch, almost to the New Hampshire border. The company offers day, weekend and longer trips, some which involve camping in the bush. Explore parts of Grafton Notch State Park and, on longer trips, head into the more remote parts of Maine’s woodlands. A day-long dog-sledding course is also offered, where you learn the basics, harness the dogs and drive the sled. Another outfitter is New England Dogsledding (newenglanddogsledding.com) in Mason Township, also near the New Hampshire border. They offer everything from one hour introductory rides to three hour National Forest Tours. Guided “Learn to Mush” packages are also offered. Maine Dogsledding Adventures (mainedogsledding.com) is in Millinocket, east of Baxter State Park. The focus is on the vast expanse of that park and the eye popping mountain scenery. Half-day, full-day and two-day dog sledding adventures are offered. Rangeley Region Sled Dog Adventures (rangeleydogsled.com), located in Rangeley, offers two and six-hour day trips, a two-day tour that explores Parmachenee Lake and includes a stay in a Bosebuck cabin, as well as group dog sled outings. A special two to three hour Kid’s Camp teaches the little ones about feeding and harnessing sled dogs and takes them on a short ride on a small one-dog sled. If a litter of puppies is available the children are welcome to indulge. Sunday River Resort (sundayriver.com), in Newry, is a full-service ski-resort that just happens to offer dog sledding through its outdoor center. Operating during the ski-season only, guests of the resort enjoy half-hour dogsled tours around the property. The rides are complementary but reservations are needed because they do fill up fast. 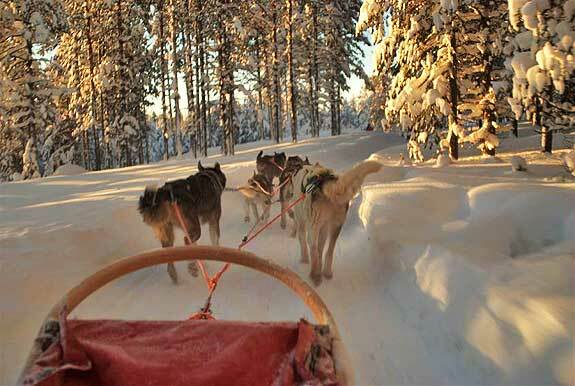 The rate for a dog sledding tour depends on the length of the trip and the inclusions. One hour rides average $225 per sled for up to three people or 325 pounds. Different operators have different weight limits. Two-hour and three-hour tours run between $300 and $400 per sled for a party of two. If you want a single sled, add $50. Three-day “Learn to Mush” packages including all meals and nightly accommodations run roughly $925 to $1150 per person. The Kid’s Camp package currently runs $200 per child. Each March, the Can-Am International Dog Sled Races (can-am-crown.net) brings mushers and spectators from across the country. The longest race is a 250 mile circuit beginning and ending at Fort Kent and is a qualifier for the Iditarod. Thirty teams take up to four days to make that circuit. A sixty-mile and a 30-mile race also leaves from Fort Kent. Now in its 20th year, the annual event is serious business for dedicated mushers and fun for all. If you are planning to attend, book early because lodging in the area fills up quickly. The Maine Lakes Mushers Bowl (mainelakesmushersbowl.com) in Bridgton is the “Super Bowl” for Maine mushers. Combine that with the Musher’s Bowl Winter Carnival and you have entertainment for everyone involved. The highlight is the sled dog races, but along with that is the chance to ride in a horse drawn carriage, do a bit of ice skating or snowshoeing or participate in one of the public breakfasts, lunches or dinners. Snowmobile rides are offered, and yes there is a chance to learn to mush a dog sled on your own. Either that or put on your skis for a bit of skijoring and let a frisky four-legged friend pull you through the snow. Visitors to the state enjoy a dog sledding trip through Maine's wilderness area.